What do you mean by an application essay? An application essay is a type of essay which is usually written as a submission for an application for many programs. The programs include graduate programs, special academic programs and the internship programs. These essay write ups are very critical and important for the entry submission procedures and can decide student’s fate. And for that, the students should take up equivalent and good time for preparing and processing an application essay. The essay that that you will write should reflect your potential, your skills and your abilities. It should also reflect the professional goals, the reason why the specific program is suited for you, what benefits will you provide to the program from your side, etc. The first thing which should be countered in the application essay department are the doubts and unclear topics. We provide expert English tutors who are proficient in writing and teaching how to write the application essays and thesis work. These English tutors are highest degree holders in this field. We provide best services at this price range. Our services are 24* available. The most basic task before starting to write an application essay is to read the instructions very carefully. The directions which are stated in the instruction page should be followed. If these instructions are not followed while writing, then it may leave a very bad impression on your report and the reader may conclude that if you are not following in this essay writing, then eventually you will also not follow the instructions in the program. The page limits as well as the word limits should be followed. There are basically two forms of essay writing, a single page essay write up which answers a very general and simple question, on the other hand there is essay of several short answers which are to more specific questions. Before giving the essay writing, do some research also on some things which are very relevant with the application. It includes about the program, about your own skills and abilities, the reason why you want this program and the field. 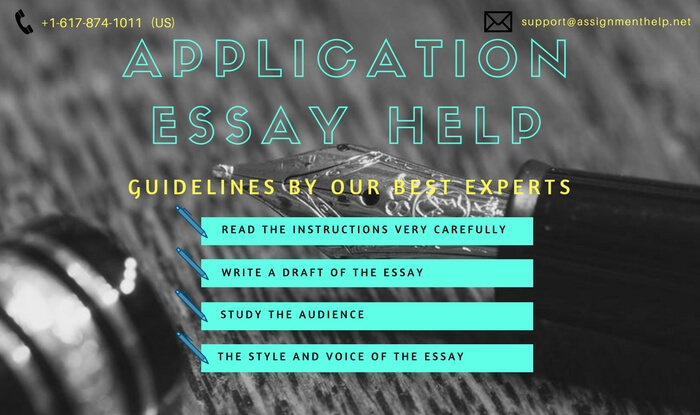 Application essays are one of the toughest form of essay writing. It is more professional and also more personal than the other types of essays. Start by getting the right topic or if the topic is already mentioned to be written upon, then start with the research work on it. Try free-writing and practice it. Do not get carried over by anything, any grammar mistakes or punctuation mistakes. Just be with the flow and write. When you are writing the draft, think about the most reliable and best marked statements which will still hook the reader’s attention. Delete or omit any extra sentences and paragraphs which are making the essay look baggy. Find what is specific to you about the ideas that generated those platitudes and express them more directly. Eliminate all the irrelevant issues and statements or the ones that might be controversial for your reader directly or even indirectly. Applications might have sometimes several short-answer essays which require even more detail and preciseness. The main thing to remember is to get straight to the point in each and every case, and address the subject, what they’ve asked you to address. The next main thing is to study your audience. Audience are the readers, the judges and your critics. Before writing an essay, make sure you have studied your audience well, their likes and dislikes, their notions and beliefs, etc. Make your essay such unique that the reader, who have a thousand application essays to read, will pick and choose yours to read. The essay is a great opportunity to communicate what your desires and beliefs are with the program and readers. Make sure to your audience that you understood the program and its challenges and responsibilities and not just the benefits. Write a clear and organized essay which will show that you care about your reader’s time and don’t want to waste it. A concisely written essay is very well appreciated and read. Make sure your readers that you understand the program well and the nature of the work. Show that you are ready, morally as well as psychologically. Assure your audience that you are capable academically, interesting to have around, and willing to stick to the program’s demands. Don’t waste extra space with repeated information which you have already provided in the rest of the application. Every sentence should be new and effective and is directly related to the rest of the essay. Don’t crumble or use fifteen words to express something which you could say in eight words only. By the voice, it means that how your tone is in the essay. The voice should be yours in your essay, it means that you should use ‘I’ in the essay. The tone of your voice should look professional as well as intelligent. It should have appropriate amount of phrases and idioms but not too much of them. Create an impression which will last for the last. Style denotes the style structure of your essay which refers to the body and type of the essay writing. Some essay write ups are cramped with many dramatic parts and paragraphs. A well-written and well anticipated dramatic essay is much more memorable than one that fails miserably to make an emotional impact with the reader’s mind. Good anecdotes, short stories and personal insights can really attract the reader’s attention. But you have to be careful not to let your dramatic part turn into melodrama. You want your reader to see your choices motivated by passion and drive, not delusional and a lack of reality. Don’t invent drama on your own where actually in reality there isn’t any, and don’t let the drama take over the topic of your essay. Before going a further, make sure you make someone from your friends or family to read the essay for you. Application essay are very important for writing in the college applications. Students get sometimes in this and needs some great assistance. We are the best assistance p0roviders in the business with high quality work, n=best tutors to look after and best in type study materials. We also provide specially curated sample essay papers on the application essay subject. All this will help the student in developing a liking for the subject and also help in acquiring good grades in the class. The writing skills of the student will also get specialized. Having more options in the type of application essay, it becomes more complex. To tackle this, we also provide example theories and sample and also model essay papers. Or work is 100% plagiarism free and completed within the deadline. To know more about the services, contact us or visit our website assignmenthelp.net. We are just a call away.